It’s RHUBARB SEASON! A huge cause for celebration in my house. I’ve posted at least six recipes containing this delicious fruit over the years and just had to re-post this salad dressing recipe (originally posted exactly SIX years ago). It’s that good! Although it is still pretty cold and on-and-off rainy here, bundles of rhubarb appeared everywhere at yesterday’s farmers market here in Seattle. I usually associate this vibrant vegetable (yes – it’s a vegetable!) with Springtime – so I was pleasantly surprised to see displays of the celery-like, ruby-colored stacks. I purchased a few bunches and immediately starting trying to figure out what I could make besides the traditional rhubarb crisp, rhubarb upside down cake or rhubarb pie. I was in the mood for something savory and two recipes popped into my mind: a wonderful sweet and sour type chicken dish, and a tangy, pink-colored salad dressing that would be good on a main dish salad. And it just so happened that I had a left-over chunk of rare beef tenderloin steak in my refrigerator along with some steamed sweet potatoes, blanched asparagus spears, toasted walnuts, and various peppers and root vegetables. And of course I had some organic salad greens – in this case arugula. It took just one try to make a gorgeous, zesty salad dressing. Just a little different from my usual and a much more seasonal version. I was so pleased with the results that I’ve decided this vinaigrette is going right into my regular spring line up! In a small saucepan, simmer the rhubarb in water, covered, for 5-10 minutes until it is very, very mushy. Put the stewed rhubarb with all the remaining liquid into a blender with the honey, vinegar and mustard. Pulse until smooth. With the motor running, slowly pour in the oils until it thickens. Store in refrigerator for about a week. I love these seasonally inspired dinners! And many of you will find rhubarb growing in unexpected places or at local markets. Be sure to watch for next week’s chicken rhubarb creation. Most people have a love/ hate relationship with Brussels sprouts. Personally, I have a “thing” for these tiny cabbage-like morsels. I love them, and I can eat them day after day after day. A few years back, I was with my sisters in Boston and I believe all three of us ordered Brussels sprouts every night for probably five nights in a row. That’s how we rock and roll. Admittedly, this recipe with it’s method of cooking is a pain in the neck, I won’t lie. Even though there are very few ingredients, it digresses from my usual steaming only or oven blasting. 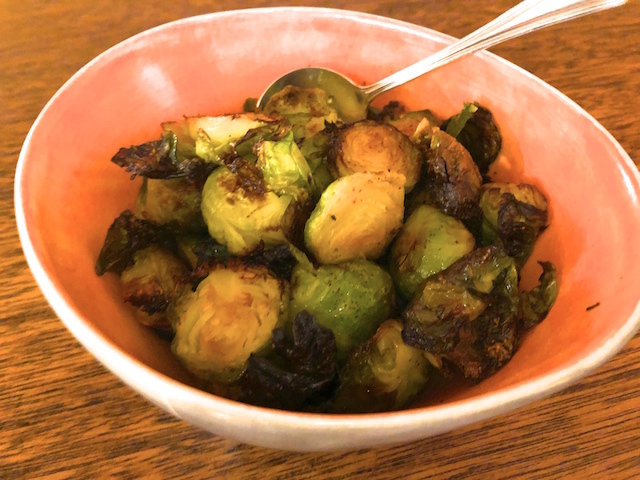 BUT if and when you have the time and want to eat the best Brussels you have ever tasted, make these. It involves blanching, then sauteeing in a small amount of butter, and finally roasting. The finished sprouts come out crunchy on the outside, creamy yummy on the inside, and I could eat pounds and pounds of these. But you already knew that. Just one of the many steps – but SO worth it! Bring a large saucepan of water to a boil. Add 1 teaspoon of sea salt. Wash and trim stems of all Brussels sprouts, then cut a shallow X in the bottom of each sprout. 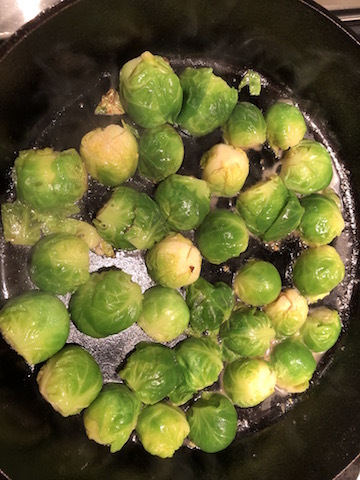 Put all sprouts in the boiling water and cook four minutes, uncovered. Remove the sprouts with a slotted spoon and place directly into an ice-water bath. Once cool (~ five minutes), drain the sprouts in a strainer and shake off as much water as you can. Cut sprouts in half lengthwise. Put them on a dish towel and pat to remove some of the moisture . Don’t get too carried away here, just blot them. Meanwhile preheat your cast iron skillet if you have one AND your oven (or better yet, your toaster oven) to 450 degrees. In a large 10-inch saute pan or cast iron skillet, melt the two tablespoons of butter. Add the sprouts cut side down, season with a bit of salt and a small amount of smoked paprika. Brown the sprouts for about five minutes. I shake the pan to get a layer of fat under the sprouts but I don’t turn them. Once brown, remove to a rimmed cookie sheet or ceramic dish with enough room for them to be uncrowded and in a single layer. Include the leaves that fall off the Brussels sprouts too! Place sprouts and the cookie sheet in the preheated oven(uncovered), and roast for about 20-30 minutes. Shake the pan every 8-10 minutes. When sprouts begin to look almost burned, they are ready. I baked mine in the toaster oven and it took me about 20 minutes, but it will be longer in a conventional oven. They should be slightly crispy and creamy in the center. Put on a pretty serving dish and garnish with fresh herbs if available. Sprinkle with a few grains of salt if you wish. My husband always dusts the tops with fresh parmesan, just a smidge but IMHO, this is over. For me, this is all I need for dinner! OK, readers – pay attention. 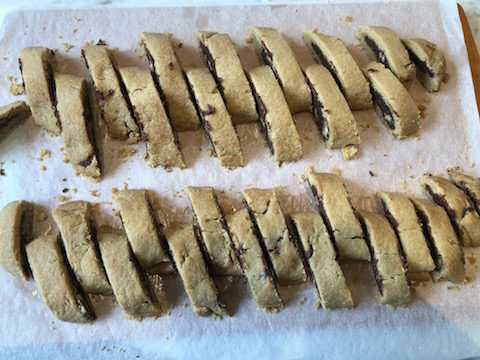 Because this chocolate strudel is one of the best things I bake. Seriously. 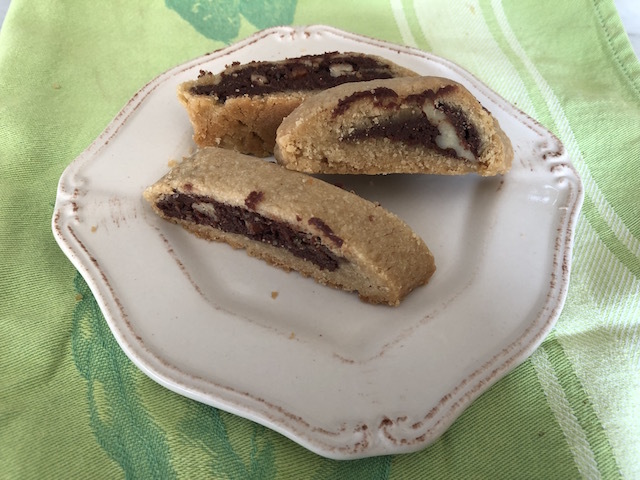 I have hemmed and hawed about sharing the recipe with you and finally I decided I am getting older and want my baking legacy to live on. Every time I serve this strudel, my eaters go a little crazy. I’ve been told more than once that the strudel should be sold in pastry shops. It is rich, chocolatey and it’s hard to imagine anything pairing so well with a cup of coffee or tea. But be warned: you can’t eat a lot of these at one time or you’ll make yourself sick. As for the origin, my mother used to make this chocolate strudel. She got the recipe from my cousin Donnie’s first wife’s mother, Mrs. Schmuckler. From Minnesota. This isn’t something I could make up. But I do have a recollection of being at Donnie’s wedding when I was probably around 10 or so. So I’ve gotta believe there’s some semblance of reality mixed in. So, here it is: our world famous chocolate strudel. I changed it up by adding bittersweet chocolate chunks in lieu of semisweet (always a good idea0 and toasting the nuts too. The dough is finicky in that it crumbles apart – so you’ll have to be persistent. I find that a pastry cloth (not silicone) helps a lot. 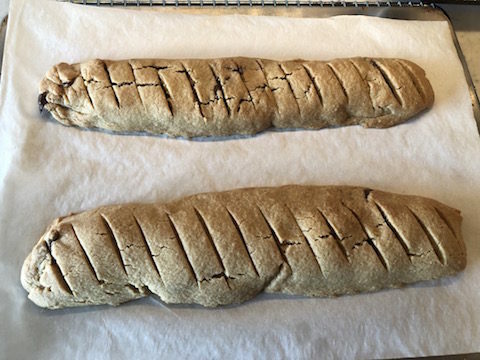 Also, Mom used to “score” the dough or make shallow slits in the finished strudel rolls before baking this and after the rolls were baked, she would slice them apart with an electric knife–not pushing down or sawing like you would a regular serrated knife. Put on an apron, recognize you are going to have to be patient and careful and go forth and bake. It’s totally worth it. Mix the dough ingredients using a food processor (I do it there) or a mixer – keep going until everything sticks together. Knead it briefly, divide into four equal parts and pat each quarter into a smooth 4” x 3” rectangle. All four rectangles go into a Tupperware and chill at least two hours or overnight. When you are ready to bake, take the dough container out at least 15 minutes before you start rolling. Put out the pastry cloth. Melt the chocolate, condensed milk, and butter in a saucepan over low heat until melted. Remove from the heat and cool at least five minutes. Have the nuts toasted and cooled in a bowl nearby. One at a time press one individual rectangle on a well-floured cloth and roll to about 8” x 13”. Be sure it doesn’t stick or you’ll be swearing. 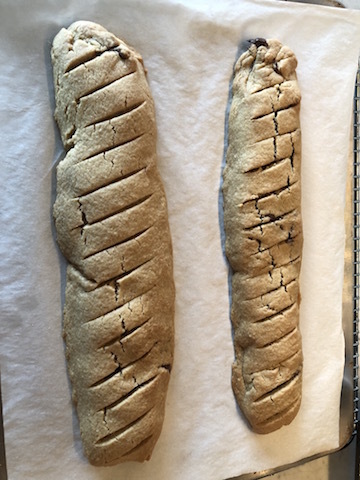 I leave the rectangles of dough in the fridge while I work on one roll at a time. Put a quarter of the filling along the bottom (the long way), about a third of the way down, close to the “lip” of the dough. Spread it evenly over that third and sprinkle with nuts. 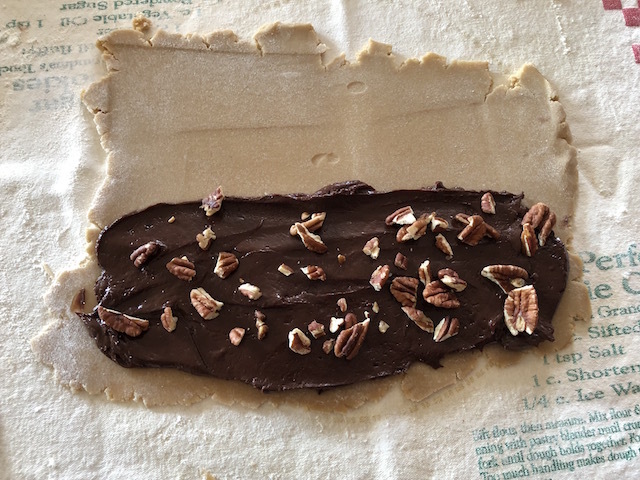 Lightly press the nuts onto the chocolate and roll tightly using your pastry cloth. 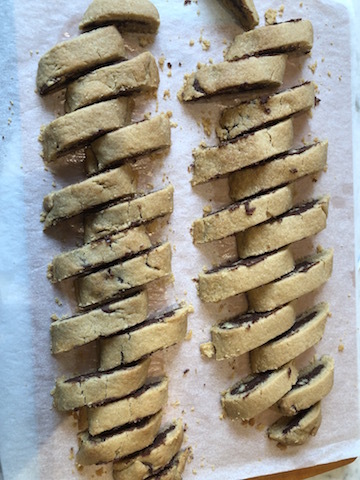 Transfer to a parchment-lined cookie sheet with the seam on the bottom and pinch the ends under. Score into 16-18 pieces. I use two rolls per cook. Bake for 30-35 minutes. When they are slightly golden, carefully slide the parchment and rolls off of the tray. Cut with an electric knife into 16-17 slices, wiping the chocolate off the knife every few cuts. Cool entirely. These stay at room temperature for five days or freeze for up the three months. Seriously – beyond great. This was originally posted in March of 2012! I’m reposting this recipe for Bolognese because it’s one of my tried and true. Plus I wanted to share a tip: lately, I have been making it with ground lamb! Often I find this is fattier, so I brown the lamb first, take it out of the pan with a slotted spoon, remove the extra fat then start with the vegetables. You can try this new version or stick with the original.Buon appetito! It’s the first Wednesday of the month again. So it’s time to keep things simple. And what could be easier than food in a tube? I know … surprising words coming from me – especially considering my penchant for fresh ingredients. However, I have come to rely on these two kitchen staples: tomato paste and anchovy paste. I am so grateful that I learned about these nifty tubes. Prior to this discovery I was forever opening cans of tomato paste only to have it spoil before I could use the entire amount. Ditto the tins of anchovies, which I use only infrequently in Caesar salad dressing or other recipes in need of a hit of salty flavor. 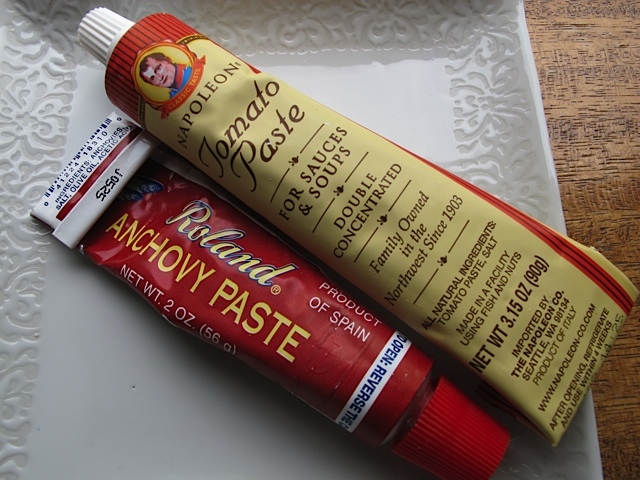 So stocking tubes of tomato and anchovy paste is, for me, a no-brainer. One of my most treasured recipes featuring tomato paste is Bolognese sauce. This is one of my favorite things to make in March, when the wind kicks up and it’s cold outside. Plus, in keeping with the simplistic theme, this recipe is very, very basic. 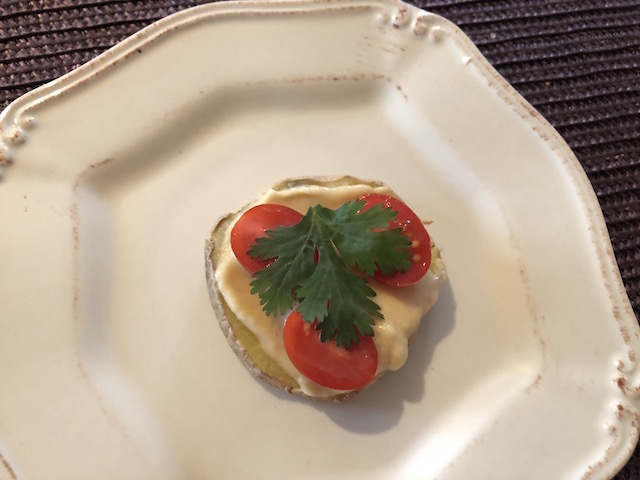 The ingredients can be found almost anywhere – I’ve even made this in foreign locales when I have access to a kitchen. 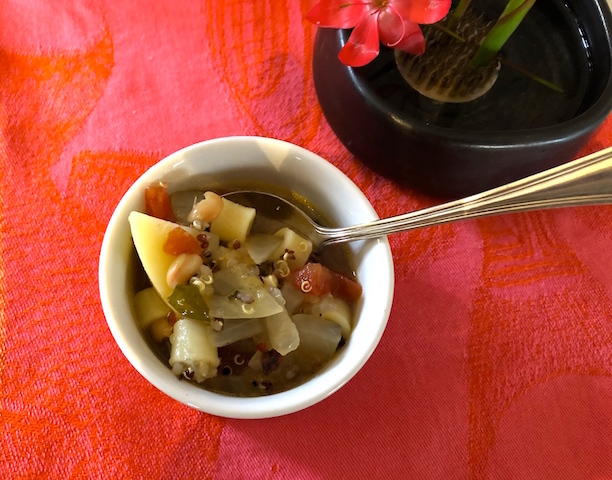 It’s a slow cooked meat sauce that can be used to top any kind of pasta (my favorite is fresh pappardelle from Delaurenti in Pike Place Market in Seattle… but you can use any kind you like). And, best of all, the house smells heavenly when it’s cooking away on the stovetop. Heat a large straight-sided pan (at least 8 inches in diameter with deep sides) over medium-high heat. Add the oil until it is hot, then add in the diced vegetables. When they have browned a bit, add the meat. 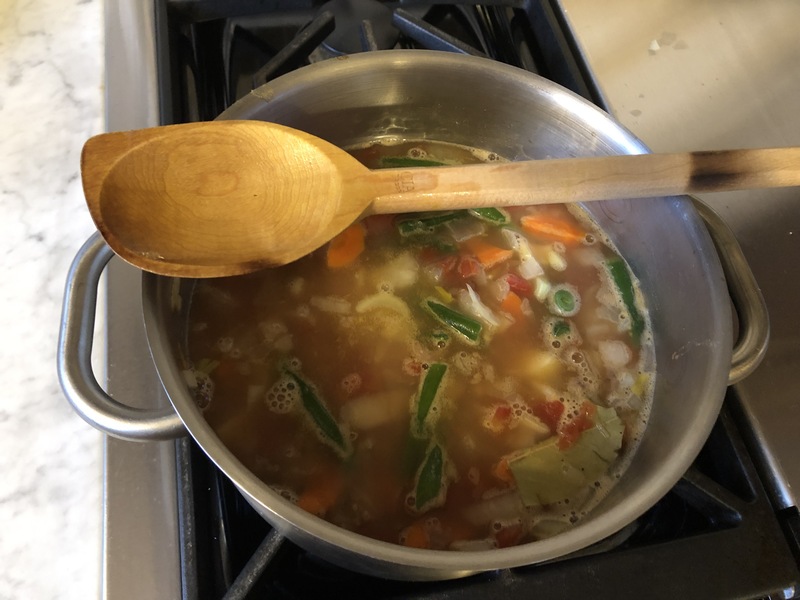 Keep stirring and breaking up the meat with a wood spoon. When it is no longer pink and lightly browned, add the tomato paste, stock, salt and pepper – stirring well to combine. It should cook on low heat for at least one hour, with the lid on, and should be stirred from time to time. Taste and adjust seasonings. This recipe can easily be doubled or tripled, and it freezes well for up to 4 months. After Thanksgiving, our daughter Rachel invited us for dinner at her very busy, very chaotic home. In addition to being a wonderful daughter and mother and wife and acupuncturist, she is an excellent cook. She manages to feed her family of five mostly homemade, nutritious meals and snacks. I know I am biased, but to say she is impressive is an understatement. So….I wasn’t surprised that our dinner was (A) something I’d never had and (B) something so tasty I couldn’t stop thinking about it. When I mentioned to her that I liked it, she looked kind of embarrassed. I pressed her for the recipe for this peanut chicken and she apologetically sent it to me. Let me back up a bit here. Almost three years ago, my youngest sister Kay came to Seattle after Rachel’s third baby was born. Kay’s mission was to help make and freeze a lot of food, to drive Rachel’s two older boys around to lessons and such, and to help the baby sleep through the night. Katie (AKA Kay) drove the minivan absolutely everywhere and said it reminded her of when her twenty and thirty-something boys were young. She got the baby to sleep 12 hours at a POP, I kid you not. And she made so many challahs and pots of soup and main dishes that the freezer was bursting. Evidently, this chicken dish was one of the things Kay made for Rachel. She told Rachel at the time that the written recipe looked disgusting but the chicken was simple as well as loved by kids and adults. The original recipe was one meal Kay made that came, of blessed memory, from Betty Crocker! Changing the original recipe, I made this with only chicken thighs and I added a generous squeeze of lime at the end while serving because lime helps everything taste fresh. I thought I had cilantro but I did not and I did miss the green on the plate. Also, I served my chicken with farro risotto, but even while or brown rice would be good to sop up the peanut sauce. Sadly, I didn’t get a photo of the plate complete with sliced cucumbers, radishes, and shredded carrots – which all helped to jazz it up a bit. Don’t judge. It is so rare that I use anything out of jars, but this is a good dish to have on a cold winter day when you want a warm meal with little trouble. I’ll admit it – it sounds absolutely gross, but fortunately, I didn’t know what the ingredients in the dish were until I ate it and oohed and ahhed. Every now and then, when you find yourself having one of those days with little time and many mouths to feed, something comes along that is dead simple to make. I think most kids would absolutely love this meal! Just consider serving it with some type of easy salad. We all need a little civility, don’t we? Oil a rectangular or oval pan, 13x9x2 inches, with cooking spray. Place chicken, skin side down, in a single layer in pan. Mix salsa, peanut butter, lime juice, soy sauce, and ginger root; spoon over chicken. Cover with foil and bake 30 minutes. Turn chicken pieces and spoon pan sauces over chicken. Bake uncovered 30 minutes longer or until juice of chicken is no longer pink when centers of thickest pieces are cut. 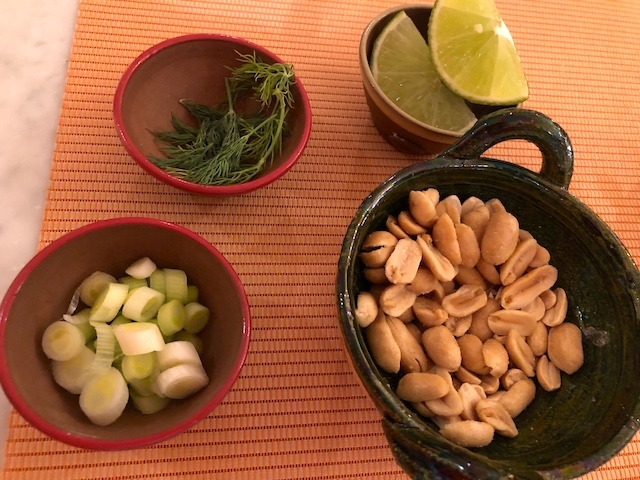 Sprinkle with peanuts and cilantro and serve each person a nice slice of lime to squeeze at the last minute. Enjoy! In February, I returned to Seattle after spending a month in Guatemala. 36 hours later, I flew to meet my sisters in the Northern Territory of Canada to see the Aurora Borealis, then returned home five days later to cold, snowy winter weather. I live on a very long, steep hill which for days has been used as a ski slope! Snow is a rare occurrence in Seattle, and everyone gets very amped up about winter weather–at least initially. 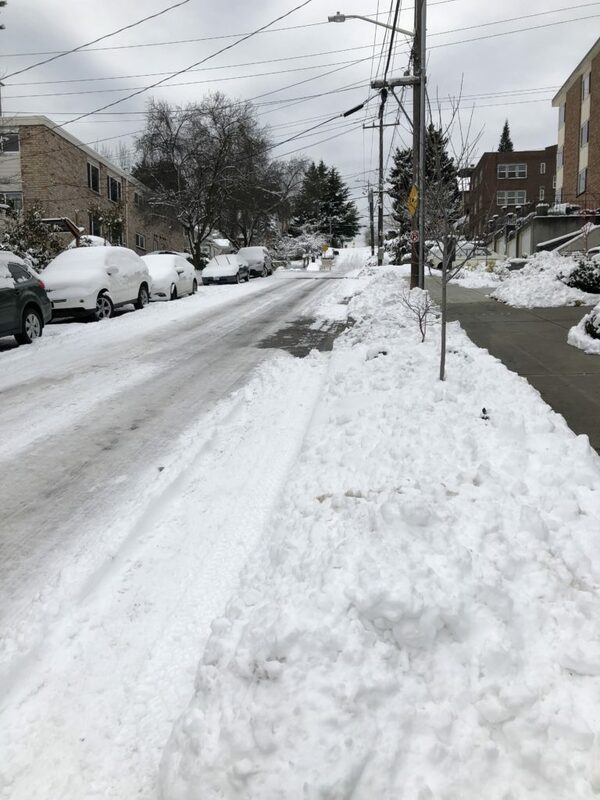 We don’t have a lot of snow plows or salt to melt the ice, so aside from the streets with bus routes, the majority of our roads are filled with snow. Me? I don’t love the snow or cold so much. That said – I know how to maneuver. I grew up in Iowa and experienced my share of snowy winters, so I am perfectly capable of driving and surviving the cold. Even so, I find most Seattleites aren’t such terrific drivers on snow and ice, and it worries me to attempt to drive most places. But even had I wanted to try to get behind the wheel, I awoke to find my hill blocked off. Of course I considered walking, but even schlepping around with yak tracks on my shoes on my steep hill was challenging. Meanwhile, my condo neighbor was outside shoveling every few hours, taking care that we would all be safe. He skied down our hill and then dropped off a bag of oranges for me. 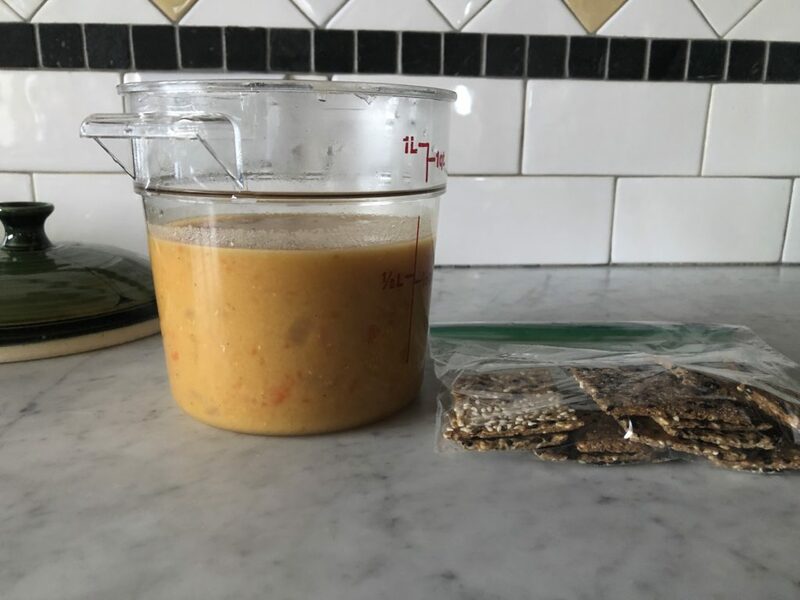 I figured I had enough food and provisions to get by until it warmed up and, after foraging through my cupboards and fridge, I decided to make a pot of lemony red lentil soup. The ingredients are all things I keep around my kitchen. All I lacked was stuff for the garnish (cilantro, avocado, tomato) which is why my photo doesn’t look so pretty. Use your imagination – it would look nice with some green and red on top. 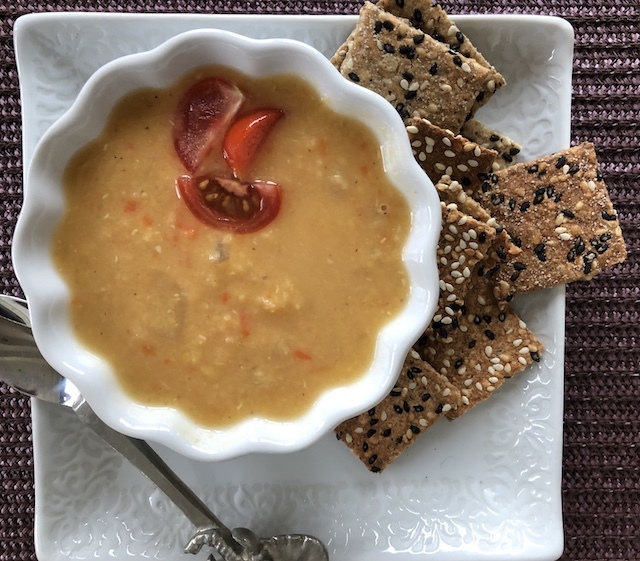 And of course, I shared some of this delicious soup, along with my homemade seeded crackers, with my kind neighbor to show my appreciation for his hard work. In a large soup pot, heat three tablespoons oil over high heat until it shimmers. Add onion and garlic, and sauté until golden, about four minutes. Stir in tomato paste, cumin, salt, black pepper, and chili powder and keep on the heat, stirring, for two minutes more. Add broth, two cups water, lentils, and carrots. Bring to a simmer, then partially cover pot and turn heat to medium-low. Simmer until lentils are soft, about 30 minutes. Taste and add salt if necessary. Turn off the heat. Use an immersion blender right in the soup pot and pulse the soup so that some smoothes out and the rest remains chunky so you have a little texture. The original recipe for this salad started with the one recently was published in her newest cookbook, Cook Like A Pro. 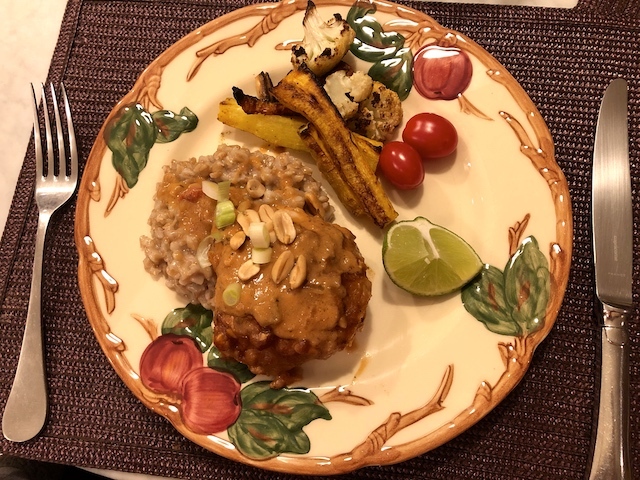 “Brown Rice with Cranberries and Squash and Marcona Almonds.” She had me at Marcona almonds and squash, two of my winter/fall faves. My brain started to whirl and I tweaked her formula – I didn’t even use straight up brown rice or cranberries. 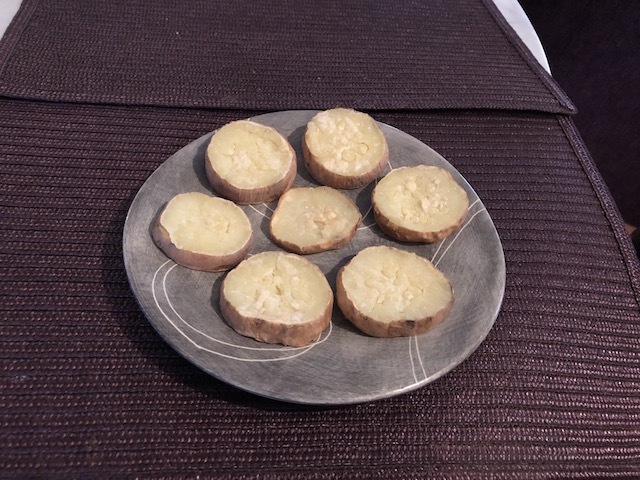 I made it with a third less rice, I added orange zest and swapped celery for green onions to suit my palate, substituted sherry vinegar for white wine vinegar, reduced some of the salt so that it can be added to your taste at the end. I also used a rice mix rather than all brown rice, dried cherries instead of dried cranberries and topped the final dish with pomegranate seeds. 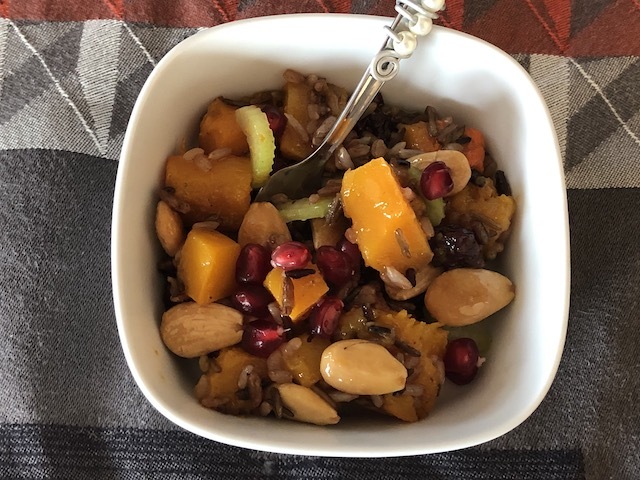 This tastes like autumn in a bowl and I am putting it on my list for Thanksgiving 2019! Preheat the oven to 400 degrees. Line a rimmed cookie sheet with oiled parchment paper or foil. Prick a large butternut squash all over with a fork and microwave for five minutes. Cool well, cut off the stem and other end, and cut in half. Peel with a potato peeler or a paring knife then remove seeds and cube into 1/3-1/2 inch pieces. Place the butternut squash on a sheet pan. Add two tablespoons of oil, one tablespoon of pure maple syrup, ½ teaspoon salt, and ground pepper. Toss together, spread out in a single layer, and roast for a total of 20-30 minutes, checking every ten minutes, until tender. Mine took about 20 minutes in my toaster oven, probably because it was par-cooked from the initial step. Meanwhile, cook the rice according to your preferred method or suggestions on the package. Set aside. For the vinaigrette, in a glass measuring cup, whisk together one tablespoon of maple syrup, the orange juice, balsamic vinegar, sherry vinegar, mustard, two teaspoons sea salt, and ½ teaspoon pepper. Slowly whisk in ½ cup olive oil then add orange zest and set aside. Pour the warm rice into a large serving bowl and add dried cherries right away so they plump up a bit. Let it cool about ten minutes and add half of the vinaigrette and combine. Add the roasted squash, celery, and almonds and toss well. (As the dish sits, it will probably need the extra vinaigrette.) Top with pomegranate seeds right before serving if you wish. Taste for seasonings and add more vinaigrette, then and serve warm or at room temperature. PS: Truth be told, I really didn’t measure a thing. I’m pretty accurate with quantities by eyeballing, but honestly, I don’t think it makes much difference. PPS: If you are making this to be served later in the day, I’d add the Marcona almonds right before serving so they remain extremely crunchy. Having said that, Marconas stay pretty crunchy even the next day. I am full into pumpkin gear here! Once Halloween hits and all through the winter I find cans of organic pumpkin on sale and I really stock up. Pumpkin cookies, pumpkin bread, or should I say breadS since I have baked probably ten loaves to date, and, of course, pumpkin scones. I’ve published other scone recipes but forgot about this one until recently. 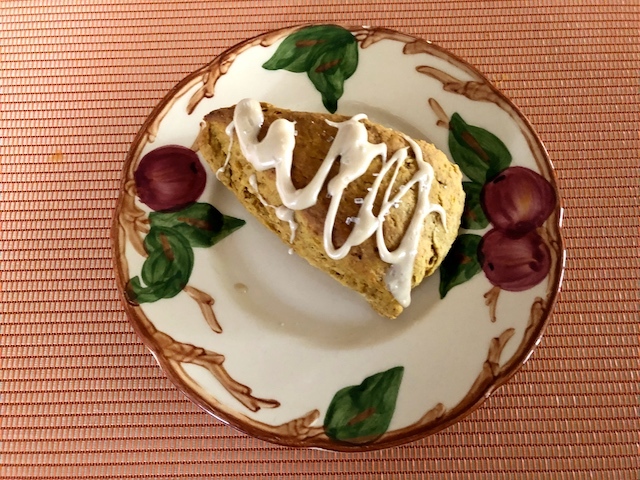 I can’t remember where I started before all the changes I’ve made with these scones, but I do know the recipe has been in my files for a very long time. Anyway, this is pretty basic and the perfect start to your morning accompanied by a cup of tea, a latte or anything else you like. Sparkly white sugar if you want to be fancy and garnish the scones. I do! Preheat oven to 425 degrees Fahrenheit. Adjust rack to the second from the top shelf. I usually put the toasted nuts into my Nutribullet with about one teaspoon of sugar and whirl them until they are very, very fine. You can hand chop them a little more coarsely, but still small (1/4 inch) if you prefer. 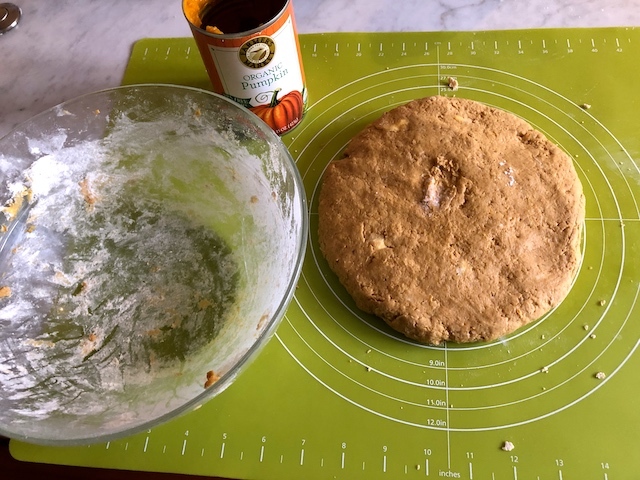 In a medium mixing bowl, combine the flours, the chopped nuts, baking powder, brown sugar, spices, orange zest, and salt in a bowl and whisk together. Use a pastry cutter or two knives to cut the butter into the dry ingredients until the chunks of butter are about ¼-⅛ inches big. Stir pumpkin puree, milk, and vanilla extract together then add to the flour mix. Keep mixing until everything is combined. Use your hands briefly to form a smooth ball. Form dough into a circle that’s about 8-9 inches wide. Use a chef’s knife to cut the circle into 10 even slices like a pie. I usually flour my knife before each cut. You will see that my silicone mat is perfect for this step! Separate slices and place on the baking sheet covered with parchment paper. Bake for 15 minutes or until they are light golden brown. Remove from the oven and slide the parchment onto a cooling rack. After 10 minutes, remove the parchment but leave the scones to cool some more on the rack. PS: If you use ¾ cup of the canned pumpkin, you should have enough to make glazed Pumpkin Bread! Once the scones are cooled, whisk together the glaze ingredients in a small bowl until smooth and creamy. Drizzle the glaze generously over the scones. Sprinkle a little sparkly sugar on top of the drizzle if you wish. At least 20 or more years ago, I was with my late sister-in-law Nancy and we were talking about pecan pie, of all things. Both Nancy and my husband loved pecan pie and it was one type of dessert I never made. I prefer either chocolate or fruit pies, but I was intrigued. Nancy told me her childhood neighbor’s housekeeper Olive in Waterloo Iowa – now, that is a mouthful – made the very, very best pecan pie. She proceeded to call her friend Janie, who just happened to have Olive’s pecan pie recipe. This is one of those desserts that isn’t healthful in any sense of the word. However, it is really good and old school – think dark Karo syrup – gasp! 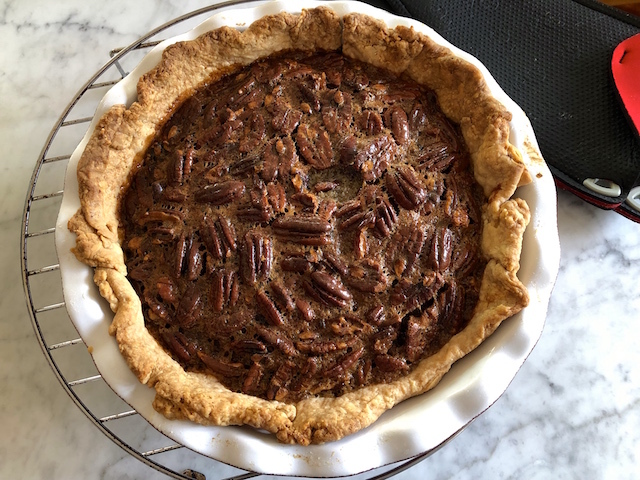 I didn’t change a thing other than I baked the empty crust for a little bit so the filling wouldn’t make it as soggy, and I toasted the pecans because, well, TOASTED PECANS. Dollop some fresh whipping cream on top and you will have yourself a pretty darned good dessert. My daughter in law Shira loves pecan pie and pumpkin pie, too, and this Thanksgiving when their family came and stayed with us before driving to Kal’s cabin, I had both a pumpkin and a pecan pie waiting for her. She is beyond wonderful to me, and she was happy to have HER special Thanksgiving pies too. For a 9” single pie crust, I roll out the crust and place in a 9-inch glass pie plate, prick it all over with the tins of a fork and bake it with pie weights for about 20 minutes at 400 degrees. I then remove the pie weights and cool the crust at least 12 minutes and then proceed with the filling. You can find one of my favorite pie crust recipes in this blog post from way back when. Heaping 2 cups of previously toasted pecans, cooled to room temperature. I leave the halves alone because my family likes chunky textures, but you could chop them if you wish. Beat and combine the first four filling ingredients. Bring to a simmer for 2 minutes then cool 10 minutes. Next, add eggs a bit at a time and finally the vanilla. Fill a partially baked (see above) single 9-inch pie crust and bake at 350 degrees for 35-40 minutes until edges puff and center is a little jiggly. Serve warmish and store the remainder in the refrigerator.